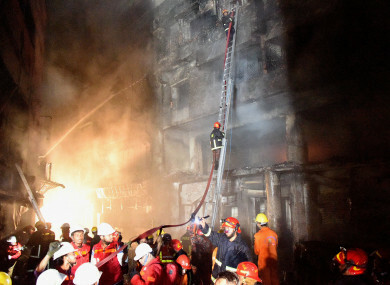 AT LEAST 70 people have been killed after a fire tore through crumbling apartment blocks in a historic part of the Bangladesh capital of Dhaka. The fire set off a chain of explosions and a wall of flames down nearby streets. “The number of bodies may increase. The search is still going on,” he told AFP. The fire started at about 10.40pm (4.40pm Irish time) yesterday at Chawkbazar in the old Mughal part of the capital. The fire may have been started by a gas cylinder and quickly spread through the building where chemicals were stored in rooms alongside the apartments, according to the fire chief. “There was a traffic jam when the fire broke out. It spread so quickly that people could not escape,” the fire chief said. “It will take time. This is not like any other fire,” he said, adding that the inferno had been made more devastating by the “highly combustible” chemicals. “The victims included passersby, some people who were eating food at a restaurant and some members of the bridal party,” he told AFP. “I saw the charred body of a woman who was holding her daughter in her lap as their rickshaw was caught in the fire,” said one witness. Email “At least 70 people killed in major apartment fire in Bangladesh”. Feedback on “At least 70 people killed in major apartment fire in Bangladesh”.